The South Island DHBs have committed to a ‘best for patient, best for system’ alliance framework that aligns with national policy. 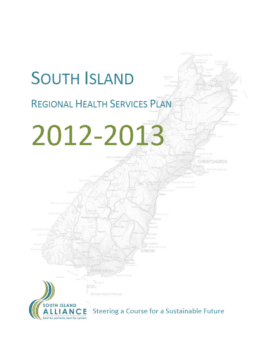 The South Island Regional Health Services Plan articulates the regional direction and key principles that will inform regional service development, service configuration and infrastructure requirements over the next several years. Our vision is a clinically and fiscally sustainable South Island health system focused on keeping people well and providing equitable, and timely, access to safe, effective, high-quality services as close to people’s homes as possible.